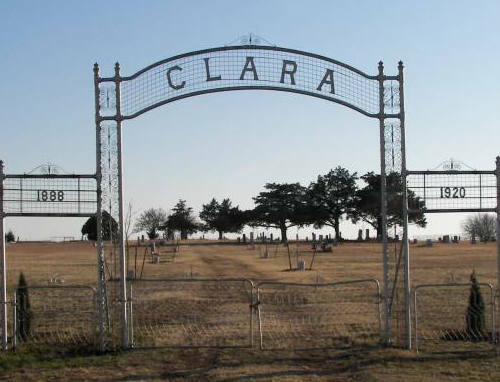 Life in Clara Texas in the early 1900s. and my aunt, Edith Johnston-Hall. 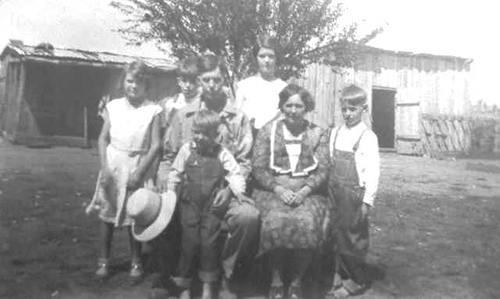 The Johnston family in Clara, circa 1929. We will try to tell you about Clara. Clara was a farming community mostly of German extraction. We had a full-blown school, 12 grades, where Edith and Revah both graduated. Clara was absorbed into the Burkburnett school system, and the three boys all graduated from Burkburnett. Our school was the focal point for the community. There were school plays, community singings, valentine parties where we exchanged valentines which we made ourselves, and Easter egg hunts, using honest-to-goodness hard boiled eggs rather than the fancy candy ones which can be bought today. There was entertainment planned for adults as well as for meeting the needs of the children. There were box suppers, ice cream dinners and the domino and "42" games brought much good-natured banter and laughter�heart warming and happy times which drew us closer together as a community. Christmas time was especially full of activities with the entire community joining in the festivities. We always had a BIG tree decorated with donated ornaments which were stored and used from year to year. After a time of greeting and visiting with neighbors, at LAST the school superintendent would give his welcome speech, say a prayer and then we would hear Santa in the distance doing his "ho-ho-ho" thing! He would rush in with his big bag thrown over his shoulder. Then he went to the tree and passed out all the presents before he opened his bag which had enough sacks full of fruit, nuts and candy for everyone. At that time we were only thinking of the present -- not realizing that memories were being made, but aren't memories great? Osborne Store was about a mile from the school where the mail boxes were posted. The postman came by every day to deliver our mail. Most of the people would gather at the mail box to collect their mail and gossip where we solved all of the world's problems-we thought! The three boys worked for farmers in the Clara area. Russell started for the Merten farm driving a tractor pulling a turning plow, combine and just about anything they wanted him to do. Mostly, I remember him pulling a combine driving a grain truck along with the combine which dumped the grain into the truck as it harvested the grain. He would then drive the truck to the storage barns where he shoveled the grain into the storage barns then back to the field to repeat the process. I particularly remember that the three boys worked for Mr. Bassett doing everything that he needed us to do. Follow the binder and shocking the bundles into shocks where it remained until the thrashing crew came through the country. They would collect the shocked grain and take it to the thrasher where the grain was separated from the straw. We would help him plant his crops� cotton, grain, whatever. I remember the first year I worked (I was 8 years old), Garland was 10 and Russell was 12. For our summer work, Mr. Bassett gave us a check for $25.00. Mother promptly collected it for us and bought a life insurance policy for each of us. Garland started working for the Klinkerman farm, and I took his place as he finished his high school at Burkburnett. I remember working for Walter Klinkerman during the week and for the local cream station. Farmers collected their cream from their cows' milk and brought it into town on Saturday where we tested it for butter fat content and paid the going rate established by the creameries who bought it from us. I had the job of preparing the accumulated cream for the creamery truck to pick up on Saturday night at approximately midnight. My employer, Vernon Thornton, was a good man to work for and he paid very well. Of course I started about 6 a.m. and usually did not finish until well after midnight�was a long day!! Our Mother, bless her, would get up long before sunup to fix our breakfast as we got to our various jobs at about sunup. We worked until sundown, then back to the machine area where we made the equipment ready for the next day. Living in the country, we had a one-acre plot that the three boys turned over with shovels. Mother and the girls would plant corn, beans, okra, potatoes, carrots - most of the vegetables our family used. We usually had one milk cow and sometimes two. We would save the cream and churn it into butter and buttermilk. Mother would sell butter and eggs. She also would do canning and she would keep 1/3 of the produce which all the family joined together to produce. We also raised a lot of chickens as well as a calf to provide meat for our table. Mother would sell eggs, butter, fryers and baking hens. Our father was extremely interested in education. He was elected to the school board when Revah started to school and stayed there until Ray finished the 7th grade which was when Burkburnett consolidated Clara into their school system. He tried to make sure the quality of education we received was the best we could get in those days, and we did get a good education in the Clara schools. Our community had quite a few things to entertain the families. We had a couple of baseball teams which would play each other and any other team from the area. We would have picnics on election days where all the people running for office would each make his pitch for their votes. Everyone around the area called our neighbor, Mr. Bassett, "Daddy Bassett" as I remember. He always had LOTS of turkeys and one year, there was an abundance of grasshoppers - like millions! Daddy Bassett took advantage of the situation, and he would herd his turkeys using a whip which he would crack over the turkeys' heads to keep them in a group. Of course it was all open grassy range, so he moved the group from one place to another and they happily gobbled up tons of grasshoppers. Great stories were told about Daddy Bassett herding turkeys! Of course, it made the turkeys fat and sassy, kept many of the grasshoppers out of our gardens, and better yet, Daddy Bassett didn't have to buy as much grain! It was a good life; we all worked hard as it was in the depression, but we also had lots of fun along the way. submitted (with permission) by their niece, Judy Johnston, July, 2006.